These fluorescently labeled sections of kidney tumors show immune cells (green) and macrophages (red). On the left is a tumor from a person who responded to targeted therapy, showing few immune cells and macrophages. 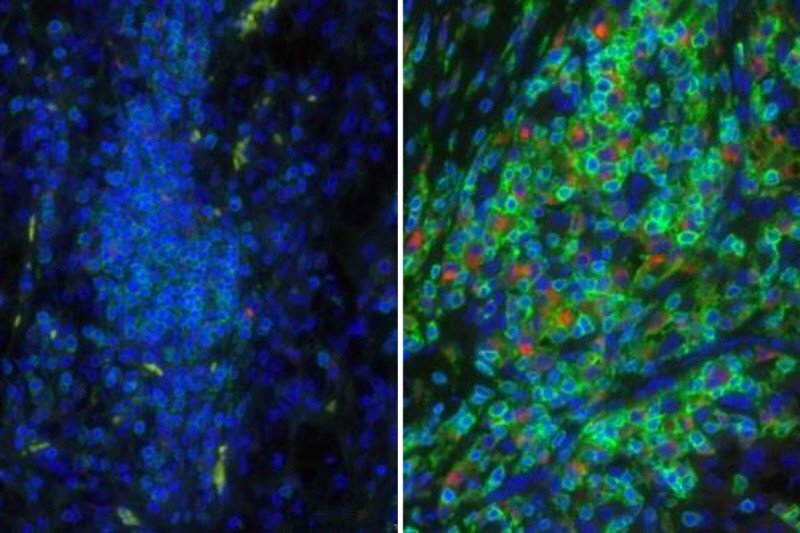 On the right is a tumor from a non-responder, showing many immune cells and macrophages. Scientists at Memorial Sloan Kettering have identified factors in a tumor’s environment that predict how well it will respond to certain cancer therapies. If cancer is like a weed that sprouts from a seed, then the tumor microenvironment is like the soil that nurtures its growth. Some microenvironments provide fertile ground for tumor growth, while others can be more inhospitable. New research from scientists at Memorial Sloan Kettering shows that the tumor microenvironment in kidney cancer also strongly influences how well the disease responds to targeted cancer drugs. The findings emerge from sophisticated genetic analyses of tumor samples taken from people with metastatic clear cell renal cell carcinoma, a type of kidney cancer that has spread to other locations in the body. These individuals all participated in a clinical trial of two targeted drugs: sunitinib (Sutent®) and pazopanib (Votrient®). The trial ended in 2013. A total of 409 patients were included in the analyses. Matching patients to drugs on the basis of these local factors, he says, could be one way to personalize treatments to make them more effective. You can't just give one drug and expect all people to respond the same. This sort of careful molecular analysis is a strength of MSK’s Immunogenomics and Precision Oncology Platform (IPOP), of which Dr. Hakimi is a member. 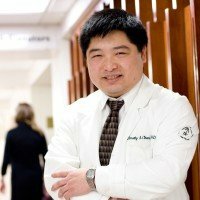 IPOP is led by MSK physician-scientist Timothy Chan. Its goal is to identify the genetic and molecular reasons why people do and do not respond to particular types of cancer drugs, with a focus on immunotherapy. Drs. Hakimi and Chan are co-corresponding authors on the new study, which was published on January 8 in the journal Cancer Discovery. The investigators’ genetic analyses revealed that there were two main variables affecting patients’ responses to treatment. One was the level of expression of genes involved in new blood vessel growth (angiogenesis). The other was the number of immune cells present in and around the tumor. The former finding was not entirely surprising, since the drugs tested in the clinical trial are thought to specifically interfere with angiogenesis. They are believed to work by cutting off the tumor’s blood supply. If cancer is like a weed that sprouts from a seed, then the tumor microenvironment is like the soil that nurtures its growth. By analyzing both specific genetic markers and sections of tumor tissue, they were able to see that immune cells called macrophages predominated in the poorly responding cluster. More specifically, the macrophages were ones that made a molecule called PD-L1. This is a protein that acts as a brake on immune cells. When bound to another molecule called PD-1, it shuts down immune responses. 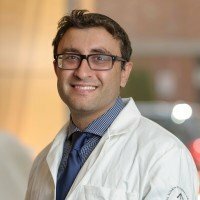 “The presence of these macrophages tells us that the body’s immune system is trying to fight the cancer, but the immune cells are basically paralyzed and cannot do their job,” Dr. Hakimi says. Though the clinical trial did not involve immunotherapy drugs, the new data are relevant to this form of treatment. They suggest that people in the macrophage-predominating cluster would do well on immunotherapy drugs called checkpoint inhibitors. These medications are designed to release the brakes on immune cells. But there’s more to the results than this. They also suggest that whatever treatment a person with kidney cancer is receiving — be it an immunotherapy drug or a targeted therapy — the tumor microenvironment matters and must be taken into account. This conclusion is underscored by the finding that the two targeted drugs tested in the trial, sunitinib and pazopanib, differed in the extent to which macrophages affected the response. This study received financial support from a Ruth L. Kirschstein National Research Service Award (T32CA082088), the Weiss Family Kidney Research Fund, Novartis, the Sidney Kimmel Center for Prostate and Urologic Cancers at MSK, and the National Institutes of Health and National Cancer Institute (P30CA008748). Dr. Chan is a cofounder of Gritstone Oncology and holds equity in the company. He receives research support from Bristol-Myers Squibb, AstraZeneca, Eisai, An2H, and Illumina. He holds a patent for the use of tumor mutation burden to predict immunotherapy response. MSK and Dr. Chan are entitled to receive royalties based on this patent. At MSK, I had combined partial nephrectomy and distal pancreatectomy for CCRCC and PNET. With those findings, coupled with retinal tumor, I received clinal diagnosis of VHL. This article mentions angiogenesis, and unusual blood vessel growth is found in VHL patients. How would this new information affect VHL patients whose CCRCC metastasizes? Dear Lucille, this is something that you should discuss with your healthcare team at MSK. Thank you for your comment and best wishes to you.